Purina's Ph.D. Equine Nutritionists have spent hundreds of hours (and counting) researching Outlast™ supplement at our state-of-the-art nutrition research farm in Missouri. Our research shows horses enjoy Outlast™ supplement top-dressed or fed as a snack before a stressful event. 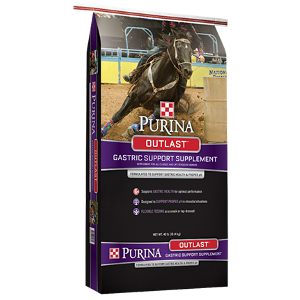 Finally, while we know your horse’s comfort has no price, Outlast™ supplement provides an a­ffordable tool to support your horse’s gastric health.